When I was a kid, nearly all of our family vacations coincided with a ministry event for my mom. Either that or a fishing trip for my dad. This weekend Curtis had plans to speak at an event for college students on Galveston Island and I seized the opportunity to get out of town with the kids. 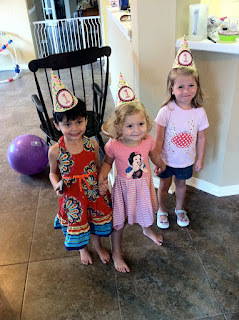 We've done this before (usually at camps) with less than ideal results, but Jackson and Annabeth are at great ages right now and this was only going to be for 24 hours. 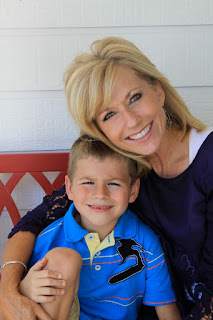 So we packed our bags and made our way out of town as soon as Jackson got home from school. The conference was at the Hilton on the Sea Wall. We checked into our room and then the kids and I said goodbye to Curtis and headed off to dinner. I didn't tell the kids where we were going in case there was a line snaking out the door. We walked less than a block away to the Rainforest Cafe. When they looked up and saw the huge volcano-looking building with a robotic crocodile in front, they got so excited. I can't tell you how fun it was to see their amazement at this very over-the-top restaurant. We sat close to the elephants and Annabeth couldn't take her eyes off of them. During one of the simulated thunder storms she hid underneath the table. 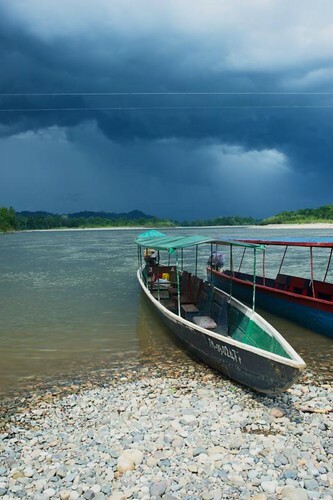 I told the kids that I had been in such a thunderstorm when I was on a boat in the Amazon river and it was super scary. I really wanted to cry but sweet Patricia kept talking to me so I would stay calm. Bless her. This is what it looked like before the storm was right on top of us. We had lava pudding for dessert, which was chocolate pudding with Oreo crumbs that looked like dirt. There were gummy worms on top of it, of course. That also reminded me of the Amazon. Annabeth did great until a person wearing a tree frog costume came to visit us. She dove back under the table until he was gone. On the way back from dinner, Jackson and I shared an incredibly special moment when he said, "Guess what, Mommy? I'm not afraid of brains anymore!" After dinner we got ready for bed and rented "The Secret World of Arriety," which is about tiny people who live in the walls of houses. Jackson was scared of being in his own bed (I'm not sure why this fear is hitting him all of a sudden) so all three of us snuggled in a double bed during the movie. Annabeth played beauty shop with my hair, which nearly put me to sleep. It took Jackson 30 seconds to pass out once the lights were off, but somehow my daughter was revived. She snuck out of bed and made mischief all around the room until about 10:30. And when she did fall asleep...she snored. Like, loud. And then, at 2 AM, I was awakened by a panicked little voice saying, "Mommy! I tee-teed the bed!" Have you ever slept in a double bed that has been christened by a pee-soaked three-year-old? I really hope you have not. Why? WHY didn't I sleep with Jackson instead? I put some towels under her, changed her clothes, threw off the comforter, and got another blanket out of the closet. Eventually we fell back asleep but it was a rough night with more snoring. The Jones family really needed a good breakfast to redeem the sorry night's sleep, so we walked over to IHOP, which had a 25 minute wait. Um, no. A kind woman (who I'd kind of definitely raced to the hostess stand) saw us leaving and suggested we go to the Sunflower Cafe. I felt so ashamed! She heaped burning coals on my head. The Sunflower was excellent. I know everyone in the restaurant was especially blessed when Annabeth started yelling, "I'm not a human being!" at the top of her lungs. This, of course, was after Curtis told her to chill out and act like a human being. Before long we were carrying our chairs, sand toys, and boogie board over the Sea Wall. We found hundreds of tiny bean clams all over the shore. The kids loved watching them dig into the sand. I'm an accomplished hermit crab hunter but I had zero success today. The waves, however, were looking mighty fine and Jackson and I took turns riding them to shore on the boogie board. There were about 10 people trying to surf in that area today, which is kind of weird for Galveston. Anyway, there was no bad smell, no seaweed, no jellyfish, and the water was the perfect temperature. It was a great day to be there. Soon Curtis had another session to teach, so we went back to the hotel to play in the pool. Bless his heart, Jackson wanted to sit at the bar and order a smoothie. He and Annabeth got to play with some other kids who were also on a mini ministry vacay. Their preferred activity was to sit in the hot tub, which made all of them miraculously calm and still. It was truly amazing and preferable to Annabeth doing her weird donkey kick move (that she thinks is ballet) around the pool deck. And now I've used up all my words. So here are some pictures. One thing I'm absolutely horrible at is taking my kids to get haircuts. I think it's because I get so sick of getting my highlights done that I dread having to deal with it. Curtis took over the responsibility of Jackson's hair long ago, but I would never put him in charge of my daughter's glory. (Her hair, y'all.) Anyway, I took her to her preschool "meet the teacher" and upon seeing the other perfectly groomed children, I suddenly realized I had let my son's school preparation overshadow my daughter's. This cannot be! 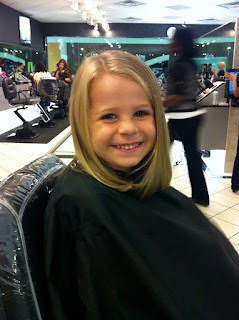 So the very next day I took her to my hair stylist and got a little brave. There were about 5 inches of her sweet hair covering the floor when I took this picture. She looks simultaneously older and younger to me now. I love it. 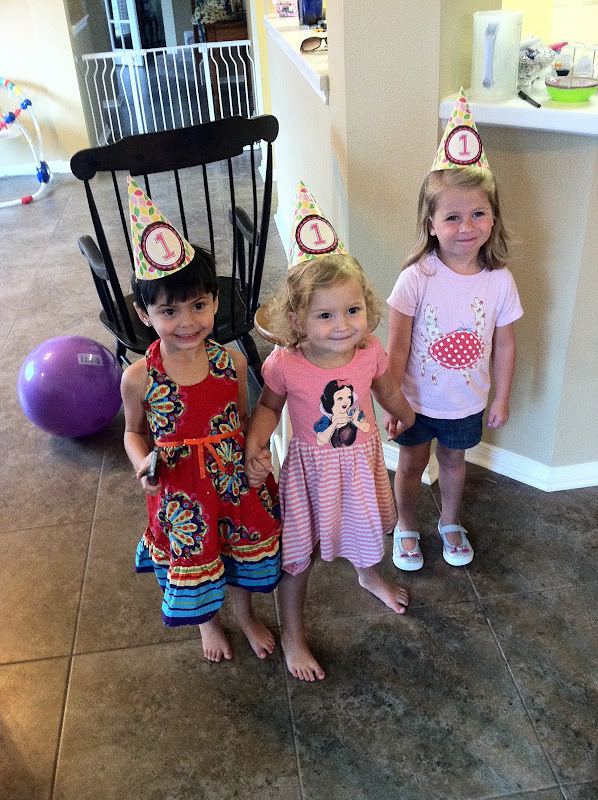 Here she is with her friends Rory and Tori at a little birthday that night. We were celebrating my friend's foster baby's first birthday. We have loved sweet Miss M since last November and are going to miss her so much when she returns to her family soon. 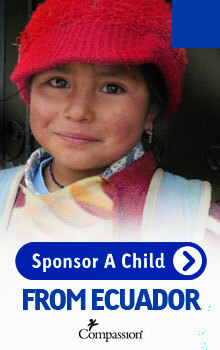 My friend has made an incredible, eternal investment in this little girl's life and I'm so in awe of her. Saying goodbye is going to cost this sweet family so much, but they have done a very good and hard thing. 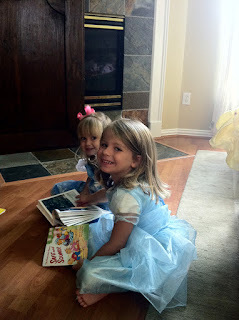 Before and after preschool, our dear friend Ellison comes over to play with us. On this day, the girls were both wearing Cinderella dresses and reading to each other. Annabeth likes to read in a language that the Lord alone understands. 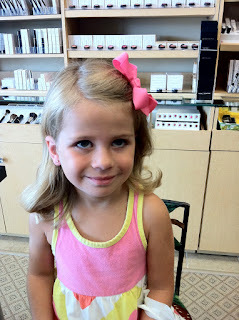 *Major milestone alert* Yesterday I took AB to get her ears pierced. She's been talking about it for a long time and I just woke up yesterday thinking it was the day. 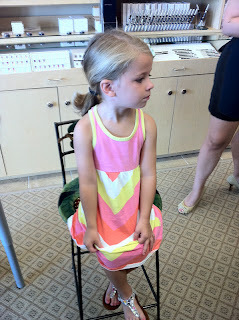 So we went to Merle Norman, where generations of mothers and daughters have done this ritual, and she sat down like a big girl. She picked out some tiny pink earrings, the nice lady put dots on her earlobes, and then the deed was done. She was very calm until about 2 seconds after the earrings went in and then there were tears. It was kind of tragic but I figured there would be tears no matter when we did it. They told me that even the 13-year-olds cry. Here's an after picture. Her feelings were still kind of hurt and the joy of her earrings hadn't arrived yet. We had lots of fun surprising Daddy, Bibby, and our friends with our new earrings. 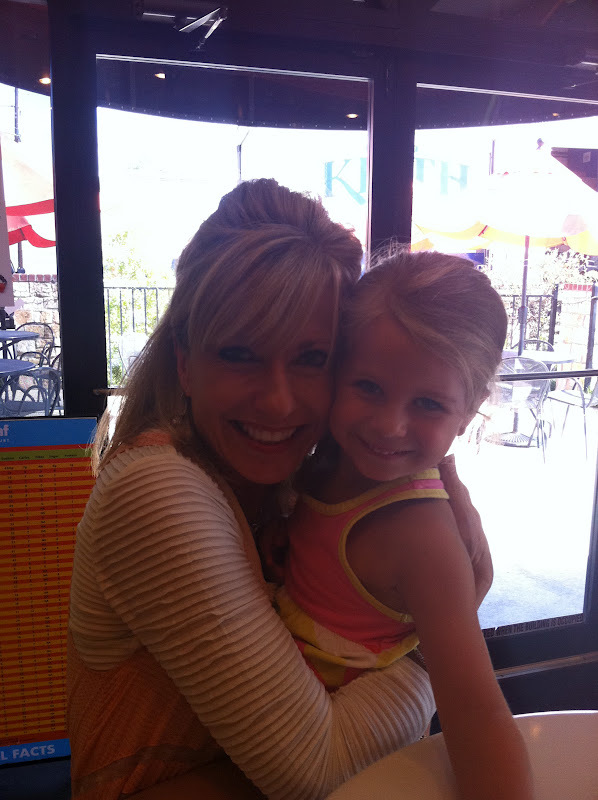 At one point I told her she had been brave and she replied that she wasn't brave because she had cried. That made me so sad! I told her that it was okay to cry, but that being willing to do it made her brave. I'm super proud of her. 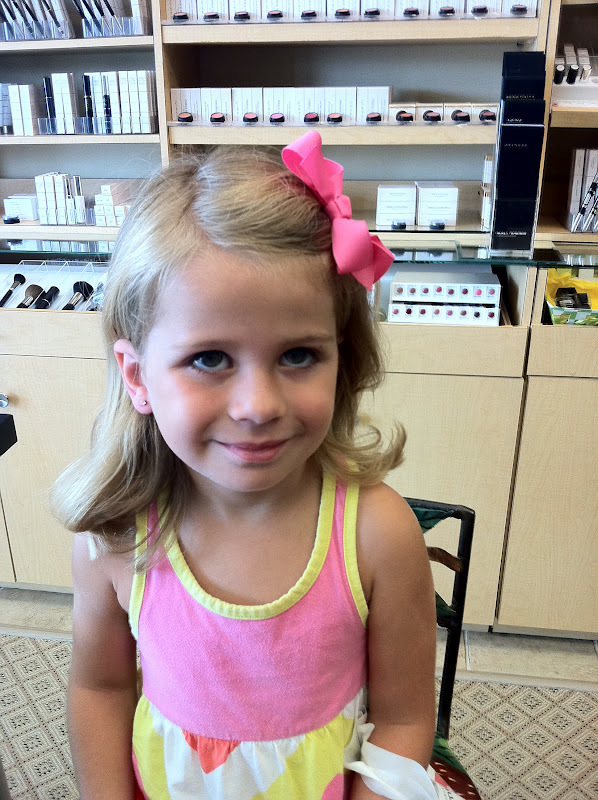 I remember so clearly the day my mom took me to Merle Norman to get my ears pierced. It was a full circle kind of moment to get to celebrate with my mom. 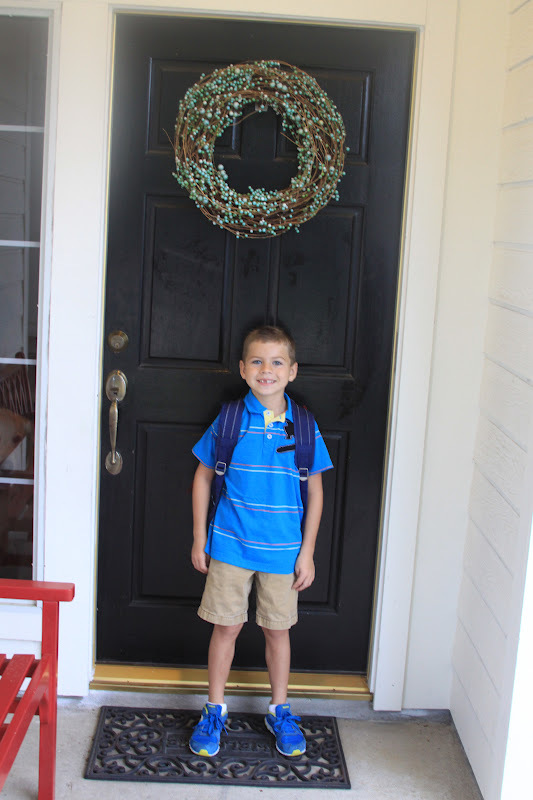 It's hard to believe that Jackson is a first grader now! He's only been back in school for 8 days but it feels like he's made this big jump into maturity. Here's his first day of school picture. Mom went with me to pick him up and then we had the traditional ice cream cake. 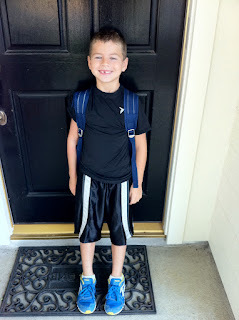 I think this was like the third day of school, but he just looked so handsome. PS - Who is going to LifeWay's Dot Mom conference in Birmingham, Alabama? It's on September 21-22. It was amazing last year and I'm so excited to get to go again. Come if you can! FYI, if that weekend doesn't work, they're having another one in the Dallas area in February.